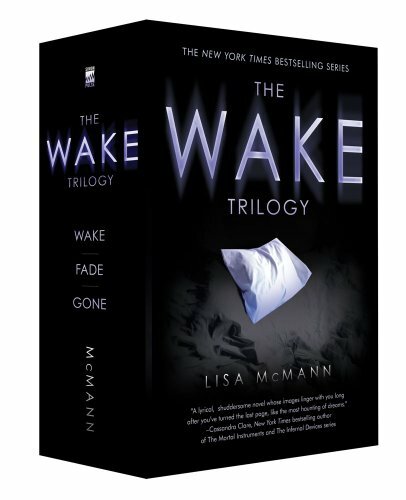 Order ‘The Wake Trilogy: Wake; Fade; Gone’ by Lisa McMann from Amazon.com by clicking the books above! It was the last day of our first family vacation in two years and the three of us were unwinding in the enormous Barnes & Noble bookstore in Burlington, Vermont. My 13-year-old son Charlie found two young adult novels she wanted to buy, both of which his friends had already read and enjoyed. The first was The Lightning Thief by Rick Riordan, which looked like it was cast in the mode of the Harry Potter books, a series that Charlie has read over and over and over. I was dubious; my kid finds the sight of blood unsettling and isn’t a fan of violence or gore. But it was technically age-appropriate and it meant reading something other than texts on his phone, so okay. He loved both books and consumed them in the next two days. This week, Gone, the third and final book in the Wake trilogy, completing the adventures of teenage dream catcher Janie Hannagan, hits the shelves of bookstores everywhere. It’s quite a wild ride.